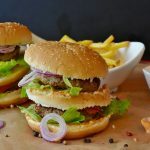 If you’re a hamburger lover who no longer wants to eat meat or simply wants to cut down on beef consumption, there are ways to get the taste and texture of a traditional burger. Start by experimenting with beef alternatives like firm tofu. Because it takes on the taste of ingredients in a marinade, you can flavor it with spices and condiments before grilling. Tempeh is another soy food, more grainy than tofu, so you may find it tastes closer to ground beef. Legumes like lentils and beans can be cooked, mashed and shaped into patties and lightly sauteed or skillet-grilled. But if you’re looking for a very simple option with a more familiar, meaty taste, look to mushrooms, especially large Portobello mushrooms whose shape mimics the roundness of a beef patty. They not only make a great tasting burger, they’re also high in nutrients, including copper, selenium and many B vitamins. Here’s how to make a savory grilled mushroom burger. Start by cleaning the mushrooms. Gently brush the caps with a damp cloth or paper towel. Because the gills can have a bitter taste, remove them by scraping them out with a spoon. Heat your grill and coat with non-stick spray. Coat the mushrooms with cooking spray as well, sprinkle with salt and place them on the grill. Cook four to five minutes, turning often, until tender. Top with a slice of a hard cheese like cheddar and cook until melted. Transfer to the buns and top with avocado, tomato, lettuce and any other garnishes you like. Fruits & Veggies More Matters has more on mushrooms and delicious ways to cook them.